Let’s Celebrate Spring! Happy Holi from the Indian Embassy in Berlin! The tradition of spring celebration is popular all around the World and it is a tradition that goes back to Ancient times. The Spring equinox has always been the time to salute the new season and to say goodbye to Winter. In the Christian world, Easter is celebrated at this time of the year, in Iran, Nowruz is held to sign the beginning of the Persian New Year, in Japan people use this time of the year to remember ancestors during Shunbun no Hi and in Russia Maslentisa is the festival of the return of lights and warmth. In India, Holi, the Festival of Colors represents the arrival of spring and the victory of good over evil, also this is the time to forget and forgive. The tradition is based on the legend of Prahland and Hiranyakshyap, an evil king who wished to kill his son in a blazing fire, but he was saved by god for his extreme devotion. The celebration is on the last day of the lunar month when there is a full moon, Phalgun. The night before Holi, Holika Dahan takes place, when people gather near bonfires to sing and dance. During Holi, the day of pure enjoyment, play with colors takes place, people spray colored water and powder on each other with pichkaris. The Indian Embassy in Berlin celebrated Holi with a Holi Special performance presented by the TanzArt Company and their artistic directors: Anne Dietrich & Jana Schmück. 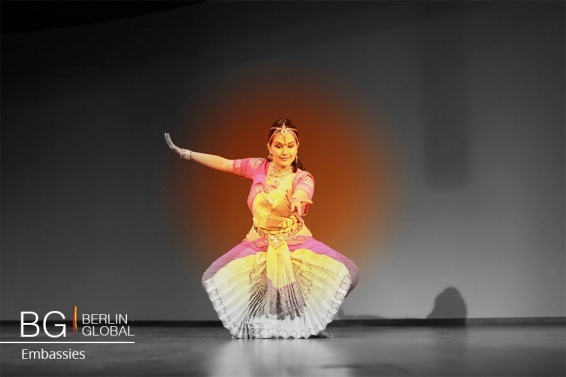 During the event, guests had the opportunity to enjoy old and new Bollywood songs with classical Indian dance and colorful traditional costumes. It was a special day at the Embassy, the building was decorated with beautiful flowers in traditional Indian motifs. 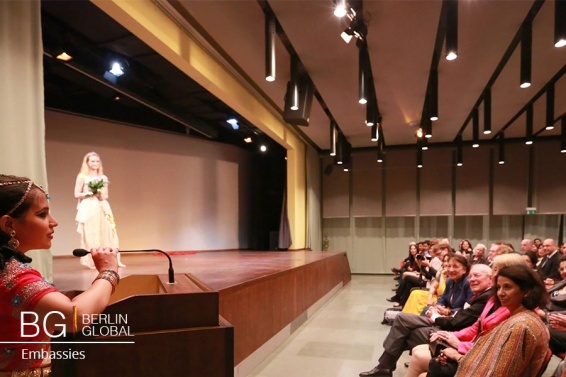 The audience including the Ambassador of India to Berlin, His Excellency, Mr. Gurjit Singh and his wife welcomed the dancers warmly and enjoyed the show. Some guests even joined in with the dancing during the most popular songs. The event successfully gave back the Holi spirit with full enthusiasm and happiness. The staff managed to create a fun and authentic environment.